My 2 year old started climbing out of the crib a few weeks ago. We transitioned her to a toddler bed and she continues to wake up around 2 am to play! And doesn't go back to bed until after 4 am. I've tried cutting her nap, which resulted in a miserable little girl in the afternoon and still waking in the middle night. I know allow her to nap for an hour and she's still up and playing at 2 am. Her bed time is around 8:30pm every night. Help! It's very common for toddlers to start waking in the middle of the night after transitioning to a bed. That's why I always recommend WAITING to give up the crib as long as possible. But don't worry: Your late-night party-girl will remember how to sleep through the night -- with your help. During the day, remind her that it's her job to sleep when it's dark outside -- plus, Mommy and Daddy get grouchy when she wakes them up at night. Everyone needs their sleep to be healthy. Adopt the "broken record" approach -- she needs to stay in bed. Lights out. Time to sleep. If she gets up or makes a ruckus, calmly guide her back to bed and repeat the rules. Don't get emotional, don't turn on the lights, don't talk much, and certainly don't offer any food, drinks, or TV. It may take a zillion or so reminders (or just a few, depending on her personality), but eventually her internal clock will win out and she'll start to sleep again -- as long as YOU'RE consistent in your approach. And when she DOES sleep through the night again, congratulate her for a job well done in the morning, and tell her how great YOU feel after having a good night's sleep! 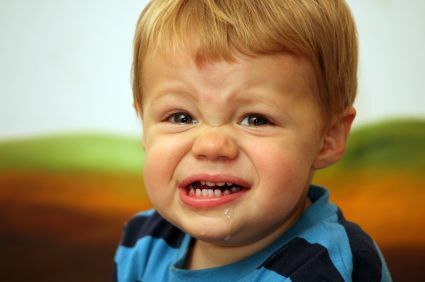 Another good question from the Parent Coaching files: Toddlers who grind their teeth. Why do they do it, and are we -- as parents -- doing anything to cause it? And more importantly, how can we get it to STOP?! For some, this is a nighttime tendency that seems to be hereditary. For others, it's a passing phase -- and more likely to be heard in the daytime. Teeth-grinding is usually just a really annoying -- but common and normal -- thing for toddlers. Aside from any medical causes you must rule out first -- dehydration, nutritional deficiencies and pinwoms (yech, I know) being among the rare but true culprits -- it's probably not a reason to worry. It's likely related to all those new choppers growing in -- she's getting used to them. Grinding is a way to feel where they are, make weird new sounds with them, and "sand down" the sharp points that often accompany new teeth. It may also alleviate the pain of teething. PLUS, it's a way to irritate you, if you show it gets under your skin! So watch your reaction -- getting upset about it might be just the fuel she needs to start doing it all the time. The majority of these cases aren't caused by -- or reflective of -- any parenting flaw. You can think of other ways to occupy her energy, time, and mouth -- like singing, word games, and crunchy snacks. But don't pay too much attention to the grinding itself. My strong recommendation is to IGNORE IT. I know it can be like nails on a chalkboard, but really -- there is no other way. The more you point it out, the more likely she is to increase the grinding. If your toddler still does it frequently after a few weeks, then it's time to have it checked by a good pediatric dentist. But I bet you'll be on to the next parenting dilemma by then. It was 2 pm, and my toddler STILL hadn't gone down for her nap. Routines were followed, milk was drunk, and the house was quiet (no small feat around here, I assure you). She was rubbing her eyes, complaining -- but plowing ahead. Throwing her little arms in the air, she was chanting, "Up! Up!" Some of you are pretty mellow about your toddler's nap schedule. But I'm the type who has to have "mellow" beaten into me with the stick of experience. "Toddlers are supposed to nap. Go to sleep, toddler of mine." Not always that easy, is it? Turns out, none of my 4 babies ever read the Weissbluth or Ferber books, and they totally failed the "How Many Hours Per Day Babies Need To Sleep" test. They didn't follow those rules, and I was left fretting that something was wrong (and trying to soothe an overtired baby). But guess what? I'm up at 3 am writing this post. Why? I can't sleep. I did my nighty-night routine, but my BabyShrink work beckoned me from bed. Your baby has important work to do, too. Sometimes, it's more important than sleep. But what does a poor parent do with an obviously sleepy (but not napping) toddler? * The best-followed routine doesn't always work. Sometimes a nap simply isn't in the cards. * Yes, an over-tired toddler sometimes means a cranky and difficult afternoon. But often, your toddler can rally and make the most out of the day. * Toddlers are notoriously wacky about following nap schedules -- some more than others. Focus on nighttime sleep, and an earlier bedtime when there's no nap. * Some parents attempt to hang on to that second nap for too long. If she used to be a good napper and now isn't, experiment with dropping the nap. * Yes, I know: Sleep is important to a baby's brain. But as with food, parents need to focus on the overall amount, over time. A bad day ( or week) of sleep isn't going to do any lasting damage (except to us). Now it's off to bed for me. If you're still awake, go and read more about your toddler's sleep challenges here. Toddler Behavior: When and How To Get Rid Of Your Toddler's "Comfort Thingie"
The "Comfort Thingie" -- your toddler's thumb, binkie, blanket or other "lovey" -- is a vexing problem to most parents. Usually yucky, stinky, shredded and gross, we'd love to chuck it, but Toddler would FREAK. HOW to get rid of it? WHEN is it OK to get rid of it? And WHY does she need it so much, anyway? * Pace Yourself – and your child. Don’t try to give up multiple Thingies at once (for instance, don’t eliminate the bottle, binkie, and crib simultaneously) and back off of the potty training until any Thingie Phase-Out has become routine. * Identify stress in your toddler’s life, and try to decrease it. * Don’t even suggest giving up the Thingie until the age of 3. Don’t waste your parental capital on this one, as often, the Thingie will be given up naturally. After 3 it will be easier to negotiate with your child for a “Thingie Phase-Out Plan”. * Rule out any medical explanation (especially in the case of head-banging) – just to be sure. And finally… Look Away and Breathe Deeply – you might as well start practicing now! Your ability to pick and choose your parental battles will be key to getting through all the phases of your child’s development with your sanity (relatively) intact. The Comfort Thingie -- while certainly disgusting now -- resolves naturally in typically developing children. Here's more on how to know when, if, and how to transition your toddler away from her Binkie. And if you still have questions, email me at BabyShrink@gmail.com, or hit the Parent Coaching button above. I'd love to talk with you about your toddler's stinky habit, and help you decide how to deal with the situation. I love it when parents say, “Our toddler is SO happy that she has a little baby brother. She seems to have accepted him totally!” Just wait. First of all, it’s important to understand how painful it is for your toddler to have to share you with a sibling. Here’s an analogy: Your partner comes to you and says, "Honey, I love you SOOOO much that I've decided to get another partner JUST LIKE YOU -- to live with us, be taken care of by me, and to mess up all your stuff. Isn't that GREAT?!" Not really. In fact, pretty sucky. That's how your toddler feels (at least some of the time). Know this: Parenting a toddler AND a baby who are fairly close in age (anything less than 3 or 3 1/2 years apart) is really, really hard. In fact, IT IS THE MOST DIFFICULT THING I HAVE EVER DONE. • Safety, of course, is Job One. Never, EVER, leave a baby alone with your toddler (at least up to age 4), even for a second. The toddler can't help herself -- and you're not allowed to get mad at her if she starts hitting while you're not looking. She’s just too young for you to expect more. • Adopt a "matter-of-fact" attitude. In normal circumstances, your toddler isn't a sociopathic maniac, and your baby isn't a traumatized victim. Baby is tougher than you think, and Toddler is less evil than you fear. • Expect your toddler to TRY to hammer away at the baby -- it's simply human nature – but let everyone know you won’t allow her to hurt the baby. Your mission is to convey this: “I can’t let you hurt the baby. Tell me you’re mad, but hitting isn’t allowed. It looks like you’re mad because Baby got to sit next to me. Am I right?” Guide the interaction towards talking. This is the perfect crucible to grind out the issue of talking about feelings – instead of acting them out. Political correctness, manners and grace come much, much later (ages 6, 7 and beyond). In the meantime, expect to be there as protector -- and try not to get disappointed, worried, or critical of your toddler. She's just really bummed about having to share you. • Resign yourself to breaking up fights -- sometimes constantly. I know it feels like you're a referee all day sometimes, and it's easy to worry about the future implications of the sibling relationship. "Will they always attack each other like this?!" They might, for a really long time -- and that might actually be a good thing. Family is the pressure cooker of life, and siblings have the opportunity to work out lots of life's big issues together: Sharing, patience, and cooperation. • But you've got to emphasize the positive. When they DO get along -- notice, praise, and reward. "What nice sharing, you two! Wow, what a lovely time you're having together. That looks really fun." Even if it's only a brief interlude in the action, make a point of praising. • Finally, make it a point to regularly schedule “special time” with each of your kids – ideally, with each parent, separately and together – to get some time where that one kid can be the focus. Nothing fancy -- even if it’s just a trip to the market while the baby is home with grandma, it will help. Smoothing out the rough edges in their relationship -- over and over -- will eventually help them create a stronger relationship. I've just had a rare parenting experience; making a meal that my toddler ate -- and enjoyed. Pediatricians tell us that toddlers need fewer calories, so not to worry. But there's another more developmental reason that toddlers often don't eat. The "simple" cycle of HUNGER -----> EATING -----> FEELING BETTER isn't really so simple for your toddler. It involves conscious awareness of a physical cue (hunger), understanding that FOOD is the solution to HUNGER, and then expressing that need to us. Not only do toddlers have better things to do than to sit and be restrained in a highchair (things like walking, running, climbing and screaming about bathtime), but they have a hard time "tuning in" to that feeling of hunger to begin with. We can all relate to that, right? Getting so consumed in an absorbing activity that we forget to eat. That's the daily experience of your toddler. Think ahead about when your toddler's likely to get hungry, and offer something she usually likes to entice her to the highchair. (Thin, crunchy breadsticks are the snack of choice at our house these days.) Then offer her a prepared meal -- don't expect her to sit and wait while you make it. If she resists, that's OK. Take her down and send her on her way. Try again at the next regular snack or mealtime. Don't panic about rejected food. You can't force a toddler eat, poop, or sleep. Putting extra pressure on the situation only makes it worse. Take a deep breath and be glad you're not contributing to a future food neurosis. Rest assured that as your toddler gets a bit older, this dynamic will naturally improve -- young toddlers have more trouble with food than older, "more experienced" toddlers do. And as she gets to preschool age (3 or so), she'll be more interested in playing social games involving food (think "Tea Party"), AND she'll have a lot more experience with food under her belt. Once again, the miracle of development will help us get through this maddening stage. Shawn poses as this unassuming urban Dad who backpacks around with his two young kids while his wife toils away at a high-powered job. So I was happy to oblige him when he asked for a guest post -- that is, until he suggested a topic that has been argued and written about for thousands of years -- sibling rivalry. Typical philosopher. I reminded him that HE'S the one who still needs to finish his dissertation, not me. But last I heard, he had bailed out of the library and was headed down to the Happiest Place on Earth, so it looks like that PhD will be claimed another day. Enter to Win Free Parent Coaching, BabyShrink Style! Got a baby, toddler, or preschooler -- and a dilemma? Want some feedback -- geared towards your hopes, needs and family style? Anything else that might be impacting your child (health, family changes, etc). Remember: Parent Coaching is NOT therapy -- just real-world solutions for everyday families. All of my suggestions are based on solid science -- plus my experience as a Parenting Psychologist, and raising 4 young children. Entries will be accepted in the comments section of this post until MONDAY, OCTOBER 4. And if you don't need Coaching, please VOTE for your favorite entries by commenting too. I'd love to talk to you in person and help you out of your dilemma. Enter now, and I hope to talk with you soon! Toddler Behavior: "Perfectionism" in A 2-Year Old? For the past few nights my daughter has insisted on putting her pajamas on herself. This would be great, except she can't quite get it by herself and ends up getting really frustrated. However, she gets even more angry and upset when I try to help her. I end up being torn between my desire to let her learn to do it herself and my desire to get her to bed at a decent hour. Usually she genuinely needs a few small helps to get the pajamas on, but I try to let her do as much as possible by herself. This also is a symptom of a larger problem - what I perceive to be a growing perfectionism on her part. For example, if one cheerio from her bowl falls on the floor she will not eat another one until it is picked up. She also is very definite about using the right words for things - she just corrected me that the noise we heard was an "airplane" not a "plane." Having struggled with perfectionism myself, I worry a lot that I might pass it on to my daughter, or that she might spontaneously develop it on her own since she seems to have that kind of personality. Do you have any advice that might help? Your daughter is just now learning that things can be done "just so". She didn't care before, and she's experimenting with it now. It's totally common and normal. It's also part of the control trip that goes along with toddlerhood. Just how far can she take this control thing? She's exploring those boundaries. It's also part of her growing sense of independence -- wanting to do it herself. A good thing, yes? But it's not always possible for her do it herself. So, the advice is -- allow her to do it her way, WHEN IT IS REASONABLE. Give her options and choices ahead of time to try to limit the struggles that may come up. You are totally allowed to step in and be the boss when you need to -- don't feel bad about it, just matter-of-fact. But allow her the independence when you can. For rituals that take forever and get in the way of other activities: plan in advance -- give her a lot of extra time in the evening for putting on jammies, and give her a lot of praise for getting steps right herself. Try to leave her to her own devices to explore her skills. Tell her to ask you for help when she gets frustrated, but don't go overboard and do the whole thing for her. She may end up frustrated anyway, but that's OK. Rescue her when she's at her limit. I think you might also be nervous about some kind of impending red flag for perfectionism, because of your own history and tendencies. Rest assured that it's normal at this age. You have the opportunity to help her live with imperfection, as well as to explore her new skills. If she is suffering from it when she is starting school, then you can start to wonder if she might need some intervention. But for now -- it sounds fine. Toddler Behavior: What Do You Do When A Baby Prefers One Parent Over The Other? Dear Dr. Heather, Our 25-month-old granddaughter has an unusually strong attachment to her mother. Her parents have been very responsive to her since her birth. Our toddler is easy with other people including her regular caregiver, grand-parents, other extended family and just about everyone else. The problem is that when her mother is around she has a strong preference for her, to the exclusion of most others. This happens about 60% of the time. Her mother and father are gentle and kind and fun-loving. They respond to her emotions and explain the world to her. They are consistent with their house “rules” and explain the world to her so that things make as much sense as possible. She is a bright, articulate, inquisitive, active little girl and appears to be developing normally. Again, the problem is just that she clings to tenaciously to her mom. This is trying on her dad and also tiring for mom. Any tips on how to reduce the clinging and increase her involvement with others when her mother is present? What you're describing is the sign of a healthy attachment to her mother. Babies at this age have a hard time being in intense relationships with more than one person at a time. Strong parental preferences are COMMON. Unpleasant at times, inconvenient often, but COMMON and NORMAL, at this age. The first step is understanding it, the next step is rewarding her when she works well with her father, you, or other adults. She should be gently encouraged and praised for steps in the right direction, but never scolded if she prefers mom, since this will only work against you. Your granddaughter is at a stage of venturing out into the world, and then coming back to her "base of comfort" as needed to "refuel", emotionally. As she gains confidence this will naturally abate. Also, as she grows closer to age 3, she will be more curious about the different activities her father and you can share with her, and this will help too. I can certainly relate, as I am currently on both ends of the preference spectrum with various of my own children. I'm top of the list with my 9-month-old and 4-year-old, and bottom of the totem pole with my 7 and 9-year-olds -- Daddy is their current favorite. All of us need to be understanding about the temporary preferences that our children express -- please don't take it personally, nor should her father. Your time (and his) will come...I promise! topic we're all familiar with...The Dawdling Toddler. Pick up a copy anywhere magazines are sold, and let us know YOUR suggestions for getting your toddler out the door in the morning.